Epithelial ovarian cancer (OC) is a common gynecologic malignancy in women. The standard treatment for OC is maximal cytoreductive surgical debulking followed by platinum-based chemotherapy. Despite the high response rate to primary therapy, approximately 85% of patients will develop recurrent ovarian cancer (ROC). This review identifies the clinical use of trabectedin in the treatment algorithm for ROC, with specific emphasis on platinum-sensitive ROC, for which trabectedin in combination with pegylated liposomal doxorubicin has been approved as a treatment protocol. The main mechanisms of action of trabectedin at the cellular level and in the tumor microenvironment is also discussed as bases for identifying biomarkers for selecting patients who may largely benefit from trabectedin-based therapies. Epithelial ovarian cancer (OC) is a common gynecologic malignancy and the fifth most frequent cause of death by cancer in women. Approximately 75% of women with OC present advanced stage disease associated with poor outcome. For these women, the standard treatment is maximal cytoreductive surgical debulking followed by platinum-based chemotherapy. In spite of this, while the median survival from the diagnosis of OC has been extended to more than 4 years, the overall survival (OS) has not changed over the last 30 years. Despite the 70%–80% response rates (RRs) to primary therapy, only approximately 15% of women are cured. The remaining patients develop drug-sensitive disease that will ultimately become resistant and have a 5-year OS rate lower than 50%[4,5]. Therefore, emerging drugs and treatment strategies for recurrent ovarian cancer (ROC) represent a continuous clinical challenge. The 4th Ovarian Cancer Consensus Conference of the Gynecological Cancer InterGroup (GCIC) established the definition of platinum-free interval (PFI) as the interval from the last date of platinum administration to documented progressive disease. However, the categorization of patients with ROC as platinum-resistant or platinum-sensitive, with a PFI of < 6 months and ⩾ 6 months, respectively, did not adequately reflect the disease prognosis because PFI constitutes a continuous variable rather than a dichotomized variable at 6 months. Therefore, it was agreed that PFI should be used to subcategorize these patients (Table 1 )[6,8]. Patients with a fully platinum-sensitive relapse typically receive a salvage second-line therapy based on rechallenge with platinum-containing regimens with RRs ranging from 30% to 75%. Among platinum-sensitive patients, those with partially platinum-sensitive disease after primary platinum-based therapy obtain substantially lower RRs to platinum rechallenge (27%–33%). Approximately 20%–40% of all OC patients had partially platinum-sensitive disease[11, 12], for whom controversies and uncertainties regarding the best post-progression treatment still exist. It has been proposed that PFI extension through intercalation of a non-platinum therapy prior to subsequent platinum rechallenge may increase the likelihood of response to a later platinum re-treatment, as we will review. ROC treatment continues to evolve while new drugs with diverse mechanisms of action are introduced into the oncologist’s armamentarium. This review identifies the clinical use of trabectedin in the treatment algorithm for ROC. In addition, the selection of patients who may largely benefit from trabectedin-based therapies and biomarkers is also reviewed. OC is a misleading term for a series of genomically and etiologically heterogenic diseases that often do not arise from ovarian tissue and simply share an anatomic location, resulting in different OC histotypes (i.e., mucinous, endometrioid, clear cell, and serous)[3, 14, 15]. Hence, given the complexity of OC, the current approaches of treating OC as a single disease has to move toward patient-tailored therapy based on molecular and histotype-driven treatments (biotypes). Recently, The Cancer Genome Atlas (TCGA) Research Network (http://cancergenome.nih.gov/) described an integrated analysis of the genomic and epigenomic landscapes of almost 500 high-grade serous OC patients with advanced stage disease, with the aim to identify molecular abnormalities that influence pathophysiology and outcomes and could constitute therapeutic targets. This integrated analysis has definitely demonstrated the low mutation rate of high-grade OC, with the exception of the tumor protein 53 (TP53) and breast cancer genes 1 and 2 (BRCA1/2), which are affected in 96% and 22% of OC cases, respectively. In contrast, extensive focal and broad DNA losses and gains were observed through genomic analyses of OC with DNA deletions and amplifications affecting many genes. Interestingly, germline mutations in the BRCA1/2 genes are significantly associated with improved OS and overall response rate (ORR) to platinum-based chemotherapy[16–19]. 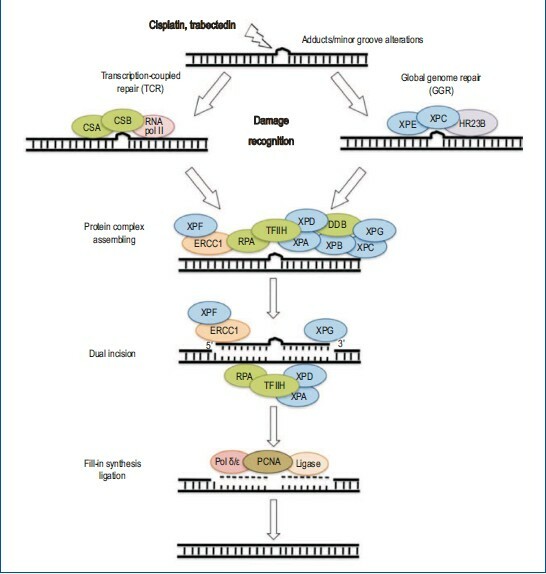 Indeed, deficiencies in the homologous recombination pathway, which is involved in DNA repair, can disrupt the repair of DNA crosslinks introduced by platinum-based chemotherapy and other DNA-damaging agents, such as trabectedin, resulting in higher survival rates due to an improved response in BRCA-deficient patients. Furthermore, these homologous recombination deficiencies sensitize tumors for targeted therapies such as poly(ADP-ribose) polymerase (PARP) inhibitors or trabectedin, as we will discuss later. Trabectedin (ecteinascidin-743, ET-743, Yondelis) is a tetrahydroisoquinoline alkaloid that was isolated from the Caribbean tunicate Ecteinaiscidia turbinate in the late 1960s and is currently produced synthetically. Trabectedin consists of three fused tetrahydroisoquinoline rings referred to as subunits A, B, and C. Experimental data strongly suggest that the cytotoxic effects of trabectedin depend on its binding to the minor groove of DNA at the N2 position of guanine with some sequence specificity . Subunits A and B of the drug are responsible for DNA recognition and binding, whereas subunit C protrudes out of the minor groove perpendicular to the helix axis. It was suggested that the C ring interaction with nuclear proteins could account for the cytotoxic effects of trabectedin, although other trabectedin analogs lacking the C ring, such as PM00128, have biological activity superimposable to that of trabectedin. Hence, the interaction between trabectedin and DNA causes an unusual DNA helix distortion, which triggers a cascade of events that interfere with several transcription factors, DNA-binding proteins, and DNA repair pathways, resulting in G2-M cell cycle arrest and ultimately apoptosis[25,26]. The initial phase I trials with trabectedin reported responses in patients with OC[27,28]. Its further development in three phase II trials with different schedules as a single-agent treatment for OC yielded ORRs of 7% in platinum-resistant and 37% in platinum-sensitive diseases; the median progression-free survival (PFS) and overall survival (OS) were considerably longer in the platinum-sensitive setting than in the platinum-resistant setting (median PFS, 6 months vs. 2 months; median OS, 20.4 months vs. 11.1 months)[29–32]. The effectiveness of trabectedin treatment was highly associated with PFI, and there were no differences in the RRs compared with prior chemotherapy lines. Phase III trial: OVA-301 (ClinicalTrials.gov identifier: NCT00113607). Patients with platinum-resistant and partially platinum-sensitive disease were randomized to receive either pegylated liposomal doxorubicin (PLD) in combination with trabectedin or PLD alone, which resulted in a median PFS of 7.3 months versus 5.8 months [hazard ratio (HR) = 0.79, 95% confidence interval (CI) = 0.65–0.96, P = 0.019). This difference was maintained in the platinum-sensitive population: PFS of 9.2 months versus 7.5 months (HR = 0.73, 95% CI = 0.56–0.95, P =0.017). Based on these results, in 2009, the European Commission granted a marketing authorization for the non-platinum combination of trabectedin with PLD for the treatment of platinum-sensitive ROC. Patients recruited for the trial included those unable or unwilling to receive carboplatin due to previous toxicity or contraindications such as platinum hypersensitivity reactions. The final analysis of partially platinum-sensitive OC (214 patients representing 32% of the whole OVA-301 series) discovered a 35% risk reduction of disease progression or death that ultimately translated into a 36% reduction in the risk of death and a 6-month improvement in median OS favoring the trabectedin plus PLD combination[34,35]. These results have been analyzed to explore post hoc the hypothesis suggesting that PFI can be artificially prolonged using a non-platinum regimen. Among 214 patients with partially platinum-sensitive disease, 121 received platinum-based therapy afterwards. Trabectedin plus PLD induced a 6-month longer median OS, with a significant 36% decrease in the risk of death compared with PLD alone (22.4 months vs. 16.4 months, HR = 0.64, P = 0.0027), most likely as a result of PFI extension (9.8 months vs. 7.9 months, HR = 0.64, P = 0.0167). Hematologic toxicities. Grade 3–4 neutropenia was fre-quent (62.7%), but neutropenic fever occurred in only 8% of treated patients. Other hematologic toxicities included grade 3–4 thrombocytopenia in 2.4% and anemia in 4.8% of patients. Non-hematologic toxicities. Liver toxicity translated into elevated transaminemia [grade 3–4 serum alanine aminotransferase (ALT) elevation occurred in 30.9% of patients treated with trabecetadin plus PLD]. Importantly, this toxicity occurred during initial cycles and decreased in frequency afterwards. Pre-medication with dexamethasone was mandatory because it reduced the frequency of this dose-limiting complication and allowed prolonged treatment duration. Cardiac toxicity was low in patients treated with trabecetadin alone (1.4%), liposomal doxorubicin alone (1.8%), or in combination (3.3%). Other toxicities such as nausea (64.7%), fatigue (58.3%), and vomiting (40.1%) were usually low-grade. From a practical point of view, due to its vesicant properties, trabectedin must be administered through a central venous catheter. Based on its mechanism of action and selective benefit, as shown in preclinical studies of the effect of trabectedin on BRCA1/2-deficient cells, the MITO-15 study has explored, in a non-randomized phase II trial, the efficacy of trabectedin on OC with mutated or wild-type BRCA1/2. The preliminary data from this study showed an ORR of 52% for BRCA1/2-mutated OC versus 41% for wild-type BRCA1/2 OC; however, this difference was not significant (P = 0.29). We do not yet have full information on the differences between the platinum-resistant and platinum-sensitive populations. With the encouraging clinical data showing the effective combination of non-platinum PLD and trabectedin, a new phase III trial has been launched called the INNOVATYON study (NCT01379989), is now recruiting, and will answer whether this combination is beneficial in terms of OS compared with standard carboplatin-PLD in the partially platinum-sensitive setting. The new compound pharmamar (lurbinectedin, formerly PM01183), which has demonstrated its activity in platinum-resistant OC, with 22% RR, will be launched in a phase III trial to assess its efficacy. Nucleotide excision repair (NER) is the primary mechanism known to remove platinum-DNA adducts (including cisplatin-induced intra-strand crosslinks) from DNA, thus increasing resistance to the drug. NER is composed of two subpathways for DNA damage detection: 1) global genome NER, which maintains the integrity of the entire genome, and 2) transcription-coupled NER, which accounts for removal of damage in the transcribed strands of active genes. Impaired NER activity is associated with several rare autosomal-recessively photosensitive diseases, including xeroderma pigmentosum (XP), Cokayne syndrome, and trichothiodystrophy . NER factors are also mutated in some human cancers, including ovarian tumors, and can therefore contribute to clinical resistance to platinum derivates. Global genome NER and transcription-coupled NER are comparable in terms of mechanism, except for the initial damage-recognition step. In global genome NER, helix-distorting base lesions are identified by xeroderma pigmentosum group C and RAD23 yeast, homolog of B proteins (XPC-hHR23B). In transcription-coupled NER, elongating RNA polymerase II encounters the lesion and recruits the Cokayne syndrome factors CSA and CSB. Subsequent stages of the two subpathways are the same. Transcription factor II human (TFIIH) is composed of xeroderma pigmentosum complementation group B (XPB) and D (XPD) subunits, which are helicase components that catalyze ATP-dependent unwinding of the DNA strands. XPA and replication protein A stabilize the open complex and position the other factors. Dual incision is then performed by the excision repair cross-complementation group 1 (ERCC1)-XPF and XPG endonucleases, which cleave the damaged strand 5′ and 3′ of the lesion, respectively. Finally, NER is completed by gap-filling DNA synthesis, followed by strand ligation (Figure 1 ). Nucleotide excision repair (NER) mechanism. NER is a particularly important mechanism by which the cell can prevent unwanted mutations by removing the vast majority of DNA damage that is produced by platinum-based therapies such as trabectedin. The recognition of these distortions leads to the removal of a short single-strand DNA segment that includes the lesion, creating a single-strand gap in the DNA that is subsequently filled in by DNA polymerase by using the undamaged strand as a template. NER can be divided into two subpathways (global genomic NER and transcription-coupled NER), which differ only in their recognition of helix-distorting DNA damage (see the text for details). CSA, Cockayne syndrome A; XPE, xeroderma pigmentosum, complementation group E; HR23B, RAD23 yeast, homolog B; ERCC1, excision repair cross-complementation group 1; RPA, human replication protein; TFIIH, transcription factor II human; DDB, damaged DNA-binding protein; PCNA, proliferating cell nuclear antigen. As for all platinum-based drugs, DNA distortion produced by trabectedin is a substrate for the NER pathway; however, the mechanism by which trabectedin interacts with DNA and exerts its antitumor activity is different from those of cisplatin. Cisplatin binds to the N7 position of guanine in the major groove of DNA, whereas trabectedin, as previously mentioned, forms monoadducts at the N2 position of guanine in the minor groove of DNA, forcing the minor groove toward the major groove and allowing possible interactions between the C-ring portion of the drug and NER factors[23,25]. Initial studies revealed a unique pattern of sensitivity to the drug in cells with defects in the NER machinery[46–49]. It has in fact been reported that NER-deficient cells are significantly less sensitive to trabectedin (from 2- to 8-fold) than NER-proficient cells. This is unusual, intriguing, and somewhat paradoxical, as a deficiency in NER is generally associated with increased sensitivity to DNA-interacting agents. The formation of lethal single-strand DNA breaks was reported to be related to a functional transcription-coupled NER pathway [49,51]. Soares et al. performed an in vitro study and suggested that the action of trabectedin in eukaryotic cells might be the result of NER inactivation through the formation of an inactive XPG/DNA trabectedin ternary complex, which conveyed the idea that NER components may represent the primary targets of the drug. In this regard, using a reverse-phase lysate microarray platform, Stevens et al. demonstrated, in a series of tumor cell lines, that XPF and XPG showed the highest negative correlations with drug activity across all three tissue-of-origin groups (colon cancer, OC, and XP cell lines). Furthermore, the increased XPF and XPG protein levels were directly correlated with trabectedin sensitivity and cisplatin resistance, as previously reported[48,54]. Despite this finding, the authors concluded that it is difficult to identify a single NER biomarker to predict drug sensitivity and that the heterogeneity of tumors and the influence of NER-independent pathways probably contribute to this complexity. It has been shown that trabectedin-induced DNA damage requires double-strand base (DSB) repair, suggesting a pivotal role of this pathway in drug-induced cytotoxicity. Hence, the homologous recombination repair of DSBs is also critical for modulating the cellular response to trabectedin in homologous recombination-deficient cells displaying hypersensitivity to the drug[21,52]. In the proposed model, the trabectedin adducts in the minor groove are recognized by the NER system, particularly by the XPG protein. The catalytic endonuclease activity of XPG was found to be dispensable, but its C-terminal region was essential for the formation of “cytotoxic complexes” that, during the S phase, gave rise to DSB lesions that had to be repaired by homologous recombination. Cells lacking the homologous recombination pathway are indeed extremely sensitive to the drug, with a decrease in the 50% inhibition concentration (IC50) by approximately 100 folds. In addition, complementation of the defects almost completely reverts the sensitivity to the normal control level, strongly suggesting that homologous recombination is a key determinant for repairing trabectedin-induced lesions. Trabectedin treatment induces the formation of both phosphorylated histone H2AX (g-H2AX) and Rad51 foci in NER-proficient cells, suggesting that the DSBs in DNA are tentatively repaired by the induction of Rad51 foci. Both events are much less evident in a NER-deficient background, suggesting that, in the presence of trabectedin, the NER pathway is responsible for the incision/excision of the DNA lesion, leading to the formation of DSBs. In addition, the induction of g-H2AX phosphorylation is much more evident in the S phase of the cell cycle, corroborating the hypothesis of a strict requirement for DNA synthesis in the formation of trabectedin-induced DSBs. The fact that a clear-cut induction of g-H2AX phosphorylation and Rad51 focus formation is observed only in NER-proficient cells can be explained in light of the experiments performed by Tavecchio et al. in S. pombe, where the formation and stabilization of a ternary complex among DNA-bound trabectedin and the Rad13 carboxy-terminal region was responsible for the toxicity of the drug. This suggests that the NER proficiency leads to the accumulation of unprocessed single-strand bases (SSBs) that can be converted to DSBs in the S phase. In contrast, the inability of NER-deficient cells to efficiently induce Rad51 foci appears to have a protective role when cells are treated with trabectedin. The accumulating evidence of the existence of a subset of tumors with specific defects in the homologous recombination DNA repair pathway, the so-called BRCAness phenotype[55,56], clearly suggest that patients whose tumors harbor those specific defects should benefit more from a trabectedin-based therapy. In an attempt to clarify these observations, Monk et al. evaluated the role of 13 proteins, which are involved in cell proliferation (Ki67), cell cycle checkpoint signaling [P53, ataxia telangiectasia mutated (ATM), checkpoint kinase 1 (CHK1), and CHK21, and DNA repair [BRCA1, BRCA2, DNA-PK, excision-repair complementing defective in Chinese hamster 1 (ERCC1), Fanconi anemia complementation group D2 (FANCD2), Nibrin, Rad50, and XPA1, as potential predictive biomarkers in patients with advanced OC using the OVA-301 phase III trial series as the study population. The authors found that low protein expression of Nibrin was statistically associated with better clinical outcome (higher ORR in univariate analysis as well as longer PFS and OS in both univariate and multivariate analyses). Nibrin also showed a high predictive value for treatment outcome in patients with platinum-sensitive disease and in those who were treated with trabectedin plus PDL, but not in those treated with PDL alone. Nibrin is a 754-amino acid polypeptide involved in the recognition and repair of DSBs. This protein interacts with meiotic recombination 11 (MRE11) and RAD50 homolog (RAD50) to form the Mre11-Rad50-Nibrin (MRN) complex and is required for translocating this complex to the sites of DSBs. The MRN complex plays a crucial role as a sensor of DSBs, in activating the signal transduction cascades that lead to cell cycle checkpoints and in regulating the DNA repair pathway selection. From the beginning of its development, trabectedin has shown some peculiar properties that clearly distinguish it from other anticancer drugs. Trabectedin not only induces DNA damage, as already discussed, but also directly inhibits growth, induces cell death and differentiation of malignant cells, and affects the tumor microenvironment by reducing the production of key inflammatory mediators[26,59–61] (Figure 2 ). It has been reported that trabectedin affects gene transcription through different mechanisms. First, trabectedin prevents the binding of transcription factors to DNA. Second, the DNA adducts formed by trabectedin functionally mimic an inter-strand crosslinking lesion, which blocks transcription by stabilizing double-strand DNA. Finally, trabectedin directly interacts with the elongating Pol II, regardless of the strands in which they are located. 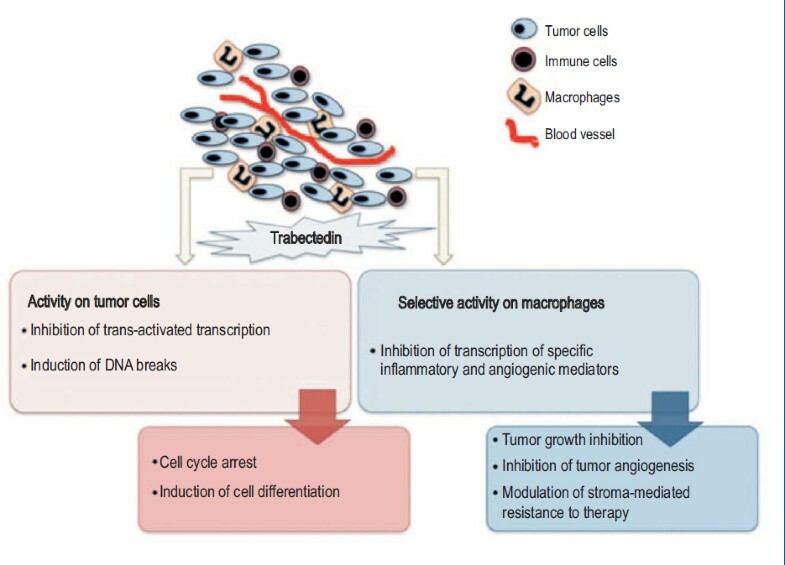 In addition to its transcriptional action, trabectedin has selective anti-inflammatory and immunomodulatory properties on monocytes and tumor-associated macrophages (TAMs), and it inhibits the production of factors potentially relevant for tumor growth, tumor progression, and the inhibition of tumor-promoted angiogenesis. Indeed, trabectedin also targets inflammatory cells in the tumor microenvironment to reduce the angiogenic and pro-inflammatory effects mediated by cytokines, thus leading to a delayed response with prolonged stabilization (i.e., tumor dormancy). For example, trabectedin treatment down-regulates the expression of interleukine-6 (IL-6), chemokine (C-C motif) ligand 2 (CCL2), chemokine (C-X-C motif) ligand 8 (CXCL8), angiopoietin-2, and vascular endothelial growth factor (VEGF), but not other biological mediators such as the tumor necrosis factor alpha (TNFα)[61,64]. The anti-inflammatory effects of trabectedin were confirmed in different tumor xenograft models and in human soft-tissue sarcoma samples from patients receiving trabectedin as neoadjuvant therapy. Hence and overall, trabectedin is probably more than a cytotoxic drug, given that its antitumor activity arises from different combinations that act through more than one mechanism, and provides a consolidated therapeutic approach as a multitarget drug with far more multifaceted activity than initially formulated. Through these mechanisms, trabectedin is likely to impact relevant biological pathways involved in cancer, which may influence disease outcome. Treatment of ROC currently constitutes a continuous clinical challenge. Considering the histological heterogeneity, distinct genetic abnormalities, and treatment responses of OC, individualized drug selection is essential for the successful targeted treatment of specific groups of patients. Furthermore, effective consolidation or maintenance treatment with new drugs with acceptable non-cumulative toxicity to reduce the risk of recurrence after a clinical response and improve survival probably will have a great impact in ROC treatment. In this sense, the OVA-301 study has demonstrated the superiority of trabectedin plus PLD over PLD alone in the overall population of patients, with striking differences in outcomes in patients with platinum-sensitive disease and in the subset of patients with a PFI of 6–12 months and a median OS prolonged by 6 months. The clinical activity of this combination has been documented to exhibit comparable activity to platinum combinations among platinum-sensitive patients; hence, the combination of trabectedin plus PLD may now represent an acceptable, non-platinum/non-taxane alternative for treating patients with platinum-sensitive relapse, particularly for patients with partially platinum-sensitive disease who can benefit from a delay in platinum re-treatment, patients with platinum-sensitive relapse suffering from platinum-induced toxicities or hypersensitivity, and patients who have received more than one platinum-based chemotherapy. Trabectedin causes distortions in DNA, promoting DNA damage that is recognized by the NER and homologous recombination DNA repair machineries. Some evidence has suggested the existence of tumors with defects in elements from these DNA repair complexes, which clearly suggests that patients whose tumors harbor these specific defects should benefit more from a trabectedin-based therapy. Several efforts have been performed to define the biomarkers able to identify this population. In this sense and although a larger series of studies must be completed for validation, the Nibrin protein constitutes a promising candidate biomarker. Low expression levels of Nibrin seem to be an independent prognostic or predictive factor of outcome in patients with OC, particularly in those with platinum-sensitive disease and in those treated with trabectedin plus PLD. Finally, trabectedin has other mechanisms of action, including direct effects on cancer cells as well as host-modulating properties (including inflammation and immune response) that appear to be of great importance for its therapeutic effect. A deeper understanding of these mechanisms will allow for the design of more effective drug combinations.